The Pom Pon Squad at Quincy Notre Dame is a year round sport. Try-Outs are held every April and summer practices start right up at the end of May. During the school year, the squad practices Monday nights and varies days before and/or after school. The squad performs at all home varsity football, boys soccer, and boys basketball games, as well as band show competitions, parades, and various community service projects. Traditions include hosting Pom camp for grade school girls before a home football game and holding a winter camp for grade school girls with a performance at a basketball game. The squad attends UDA summer camp every year. This past summer we attended camp at ISU in Bloomington, where the girls received 2nd place with their home routine, a Superior trophy for the routines they all learned at camp, and trophy for drill down winners. 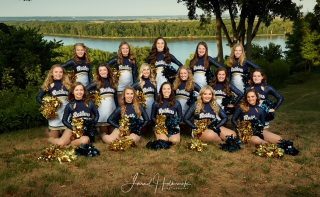 The QND Pom Pon Squad also competes through the Illinois Drill Team Association (IDTA) and the Illinois High School Association (IHSA). The 2017-18 squad placed 1st in State out of eight teams, with their Class A Pom Routine at IDTA. They are seven time State Champions in this category. The 2016-2017 Pom Squad was also honored with a trip to perform at the halftime of the Orange Bowl in Miami, FL. This was an invite only trip and the squad enjoyed the opportunity to attend this performance which was done with a live performer. This year will be full of new challenges as we rebuild and try to push ourselves to perform routines at a higher difficulty. We will continue to push to stay on top. The year looks to be another promising year for this talented group of young ladies. With hard work, dedication, a tight bond, and high expectations, the squad will show what Raider Pride is all about and represent our school on our journey back to STATE!